The first implementation of limited-access roadways in the United States was the Bronx River Parkway in New York, in 1907. The New York State Parkway System was constructed as a network of high-speed roads in and around New York City. The first limited access highway built is thought to be the privately built Long Island Motor Parkway in Long Island, New York. The Southern State Parkway opened in 1927, while the Long Island Motor Parkway was closed in 1937 and replaced by the Northern State Parkway (opened in 1931) and the contiguous Grand Central Parkway (opened in 1936). In the United States, the national Manual on Uniform Traffic Control Devices (MUTCD) uses "full control of access" only for freeways. Expressways are defined as having "partial control of access" (or semi-controlled access), meaning that major roads typically use interchanges and commercial development is accessed via cross roads or frontage roads, while minor roads can cross at grade and farms can have direct access. This definition is also used by some states, some of which also restrict freeways only to motor vehicles capable of maintaining a certain speed. Some other states[ citation needed] use "controlled access" to mean a higher standard than "limited access", while others  reverse the two terms. Sri Lanka has ensured to classify the expressways in reference to the connotation of E grades. As of 2014 [update], three expressways namely the E01 Southern Expressway, E02 Outer Circular Expressway and the E03 Colombo – Katunayake Expressway have been created. A tax levying structure is proposed for travelling via the expressways. Speed limits in the range of 80–100 km/h is attested for travelling through the expressways. Up to now two expressways namely the Northern Expressway and the Ruwanpura Expressway are in process to satisfy the needs of public transport. In Croatia, the term brza cesta (lit. "fast road") is used to describe a motor vehicle-only road, usually grade-separated, without an emergency lane, with a speed limit of 110 km/h (68 mph), although it can be lowered, usually to 70 or 90 km/h (43 or 56 mph). They range from 2+2 lane dual carriageways with grade-separated intersections and 110 km/h (68 mph) speed limit ( D2 in Osijek), four or six-lane urban streets with at-grade intersections with traffic lights ( D1 in Karlovac) or two-lane single carriageways with grade-separated intersections ( D33 in Šibenik). They are either a standalone state road ( D10) or a part of one (Southern Osijek bypass, D2). Some portions of motorways are expressways since they are either in construction ( A8 between Pazin and Matulji) or designed as such ( A6 and A7 in Rijeka). As a rule, the expressways are not tolled, however major tunnels on the expressways are tolled. Expressways in the Czech Republic ( Czech: Silnice pro motorová vozidla,, are defined as dual carriageways with smaller emergency lane. The speed limit is 110 km/h (70 mph). Expressway road signs are white on blue. In Denmark, a 'motortrafikvej' ( Danish for "motor traffic road") is a high-speed highway with a speed limit between 80–90 km/h. The most common 'motortrafikvej' has two lanes (1+1) or 2+1. There is no grade intersections. The signs for 'motortrafikvej' have white text on blue background. In Norway, a motortrafikkvei ( Norwegian for "motor traffic road"), formerly called motorvei klasse B ("class-B motorway") is a high-speed highway with a speed limit of up to 90 km/h. There are no at grade intersections. Direction signs for motortrafikkvei have black text on yellow background, while same signs on motorvei have white text on blue background. As of October 2017 the Norwegian Road DataBase show approximately 455km of motortrafikkvei in Norway. Droga ekspresowa (plural: drogi ekspresowe) in Poland refers to a network of roads fulfilling the role of bringing traffic to the motorways, and serving major international and inter-regional purposes. They are often built as ring roads since they take less space than motorway and allow more entrances and exits. All expressways start with the letter S, followed by a number. They can be dual or single carriageways and have reduced number of one level intersections. As of May 2004 the Polish government documents indicated that the country had plans of an expressway and motorway network totalling 7,200 km (4,470 mi) (including about 2,000 km (1,240 mi) of motorways). The speed limit is 120 km/h (dual carriageway) and 100 km/h (single carriageway). 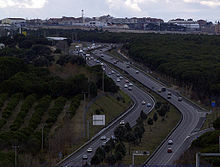 The second Portuguese type of via rápida is a highway with all the same characteristics of the above first type, except the number of carriageways that is only one. Examples of this type of roads are the ancient IP4 and IP5 (before being transformed in full motorways), the Portalegre- Beja section of the IP2, the Coimbra- Viseu section of the IP3 and several complementary routes (IC). Russia has a large federal highway network that totals approximately 30,000 km (18,640 mi). Federal highways in the country are classified into two categories: "motorways" ( Russian: магистральная автомобильная дорога, автомагистраль, not the same as the English term motorway) and "other". In Switzerland Autostrasse ( German, "auto road"), semi-autoroute, or semiautostrade ( French and Italian for "semi-freeway") is a highway that is only allowed to high-speed traffic with no crossings, but it is not the highest class road, the motorways (Autobahn/autoroute/autostrada). The speed limit on these roads in Switzerland is 100 km/h (62 mph). Most of the Autostrasse / semi-autoroutes / semiautostrade have no central barrier separating the lanes in different directions. In Ontario, expressway is synonymous with freeway and is used to mean limited-access divided-highways with no at-grade intersections, with both terms used interchangeably. An example of this is the Gardiner Expressway through western and downtown Toronto, and once it turns into a 6-lane arterial road ( Lake Shore Boulevard) east of the Don River, there is a sign warning of the end of the freeway. The E. C. Row Expressway in Windsor, Ontario is a controlled-access divided freeway with grade-separated interchanges, between Ojibway Parkway at its western terminus and Banwell Road at its eastern terminus, where there are traffic intersections at both termini. 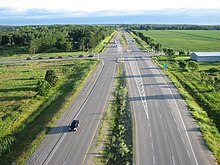 The Macdonald–Cartier Freeway would be an example of a route that uses the term freeway, however, that name is being phased out by the Ministry of Transportation. In general, the term "expressway" is used more frequently for municipally maintained roads, while provincial freeways are known more by their route number (particularly the 400-series highways are known as Highway 4__) despite some of them having an "expressway" name for all or part of their length, such as the ( Chedoke Expressway/Hamilton Expressway, Belfield Expressway, and Airport Expressway). In the United States, an expressway is defined by the federal government’s Manual on Uniform Traffic Control Devices as a divided highway with partial control of access. In contrast, a freeway is defined as a divided highway with full control of access. The difference between partial and full access control is that expressways may have a limited number of driveways and at-grade intersections (thus making them a form of high-speed arterial road), while access to freeways is allowed only at grade-separated interchanges. Expressways under this definition do not conform to interstate highway standards (which ban all driveways and at-grade intersections) and are therefore usually numbered as state highways or U.S. highways. However, many states around the Great Lakes region and along the Eastern Seaboard have refused to conform their terminology to the federal definition. The following states officially prefer the term expressway instead of freeway to describe what are technically freeways in federal parlance: Connecticut,  Florida,  Illinois,  Maryland,  and West Virginia. In those states, it is common to find Interstate highways that bear the name expressway. Ultimately, it is the federal definition that defines a road's classification whether it is an expressway or freeway no matter the preferred term. No state, for instance, could have what is technically an expressway given Interstate status just because semantically they use the term interchangeably with freeway. ^ Section 1A.13, Paragraph 29, Manual on Uniform Traffic Control Devices, 2003 ed., rev. 1. See also 23 CFR 750.153(k).